In Vietnamese cooking, we always clean bones first before making stock. Either rubbing them down with salt and giving them a good rinse with water, or parboiling the bones with salted water, cleaning the bones will get rid of all the impurities to keep the stock clear. In other words, boiling the bones first will remove all the gunk and make the stock pretty. 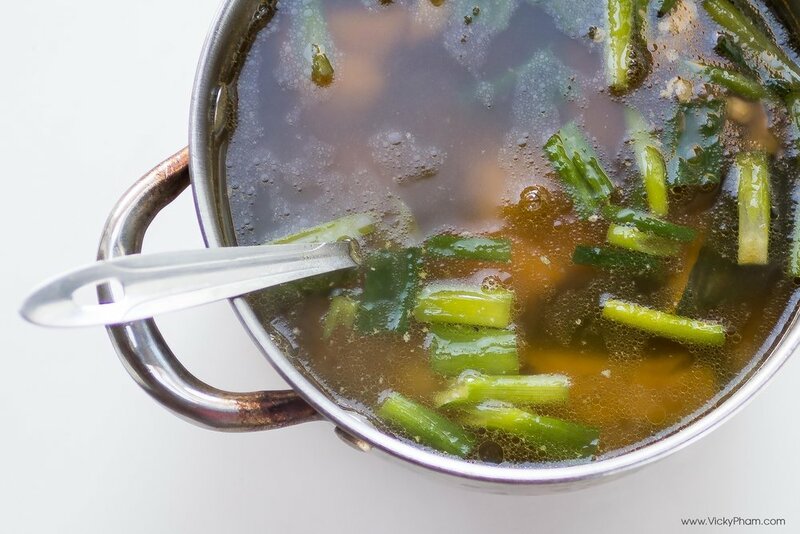 In Vietnamese cooking, a highly prized stock is a clear stock. During the cold months, Kabocha Soup or Canh Bi Do is my one of my go-to soups. Kabocha squash is plentiful, starting in the early Fall. You can find them in both Asian and American supermarkets. They are similar to pumpkins but instead of a bright orange skin, it is deep green. Some may have bumpy knobs on the surface, and the center of the squash is hollow and filled with large seeds. The flesh is bright yellow/orange and hard as a rock. When cooked, it softens and tastes sweet, making it perfect for soups and stews. If you can't find kabocha squash, substitute with pumpkin.